The satisfactory performance of an aircraft requires continuous maintenance of aircraft structural integrity. It is important that metal structural repairs be made according to the best available techniques because improper repair techniques can pose an immediate or potential danger. The reliability of an aircraft depends on the quality of the design, as well as the workmanship used in making the repairs. The design of an aircraft metal structural repair is complicated by the requirement that an aircraft be as light as possible. If weight were not a critical factor, repairs could be made with a large margin of safety. In actual practice, repairs must be strong enough to carry all of the loads with the required factor of safety, but they must not have too much extra strength. For example, a joint that is too weak cannot be tolerated, but a joint that is too strong can create stress risers that may cause cracks in other locations. Aircraft Fabric Covering, sheet metal aircraft construction dominates modern aviation. Generally, sheet metal made of aluminum alloys is used in airframe sections that serve as both the structure and outer aircraft covering, with the metal parts joined with rivets or other types of fasteners. Sheet metal is used extensively in many types of aircraft from airliners to single engine airplanes, but it may also appear as part of a composite airplane, such as in an instrument panel. Sheet metal is obtained by rolling metal into flat sheets of various thicknesses ranging from thin (leaf) to plate (pieces thicker than 6 mm or 0.25 inch). The thickness of sheet metal, called gauge, ranges from 8 to 30 with the higher gauge denoting thinner metal. Sheet metal can be cut and bent into a variety of shapes. Damage to metal aircraft structures is often caused by corrosion, erosion, normal stress, and accidents and mishaps. Sometimes aircraft structure modifications require extensive structural rework. For example, the installation of winglets on aircraft not only replaces a wing tip with a winglet, but also requires extensive reinforcing of the wing structure to carry additional stresses. Numerous and varied methods of repairing metal structural portions of an aircraft exist, but no set of specific repair patterns applies in all cases. The problem of repairing a damaged section is usually solved by duplicating the original part in strength, kind of material, and dimensions. 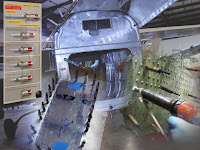 To make a structural repair, the aircraft technician needs a good working knowledge of sheet metal forming methods and techniques. In general, forming means changing the shape by bending and forming solid metal. In the case of aluminum, this is usually done at room temperature. All repair parts are shaped to fit in place before they are attached to the aircraft or component. Forming may be a very simple operation, such as making a single bend or a single curve, or it may be a complex operation, requiring a compound curvature. Before forming a part, the aircraft technician must give some thought to the complexity of the bends, the material type, the material thickness, the material temper, and the size of the part being fabricated. In most cases, these factors determine which forming method to use. Types of forming discussed in this article include bending, brake forming, stretch forming, roll forming, and spinning. The aircraft technician also needs a working knowledge of the proper use of the tools and equipment used in forming metal. In addition to forming techniques, this article introduces the airframe technician to the tools used in sheet metal construction and repair, structural fasteners and their installation, how to inspect, classify, and assess metal structural damage, common repair practices, and types of repairs. The repairs discussed in this site are typical of those used in aircraft maintenance and are included to introduce some of the operations involved. For exact information about specific repairs, consult the manufacturer’s maintenance or structural repair manuals (SRM).